NEW-YORK - DUFOUR, A. H.
Map maker : DUFOUR, A. H.. Date : Paris, dated 1835. Size : 7.9 x 9.9 inches. / 20.1 x 25.1 cm. 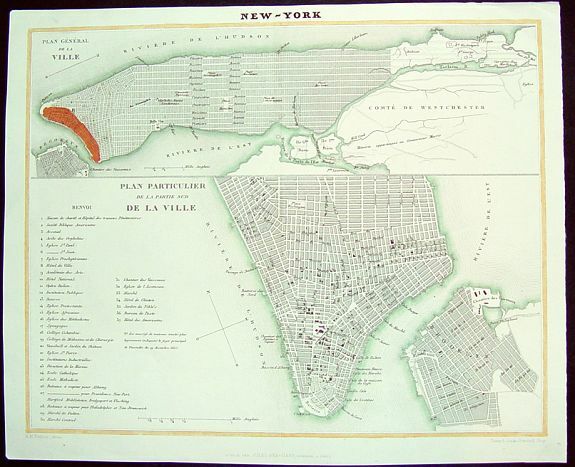 Description :A scarce, uncommon early 19th century French plan of New York City. The work is finely rendered and provides two different plans of the city. The upper portion consists of a general presentation of the entirety of Manhattan and Brooklyn. The lower section offers excellent detail of the downtown tip of Manhattan along with Brooklyn. A 37 point legend identifies key sites and points of interest. Rarely seen in the market. Condition : In exellent condition. Strong and dark impression.